As well as new builds, Wall Cladding and vertical Cladding provide old buildings with a fresh new look. Consists of the old roof covering being removed and then replaced with a new Roofing System. Overcladding is a very successful method of hassle free roof replacement and will leave the building looking like new. Asbestos roofing is made up from asbestos cement and asbestos fibres and is still present on many old buildings across the country. Composite Roofing comprises of an inner liner sheet and an outer corrugated roofing panel with an insulated core, all in one composite panel. We use a wide range of liquid coating systems from a One Coat repair product, to a Three coat 25 year Guaranteed system. Safety Line should be considered for your first choice to prevent falls when access to Rooftops is required. AB Roofing Solutions Ltd can also provide nationwide roofing support to clients. 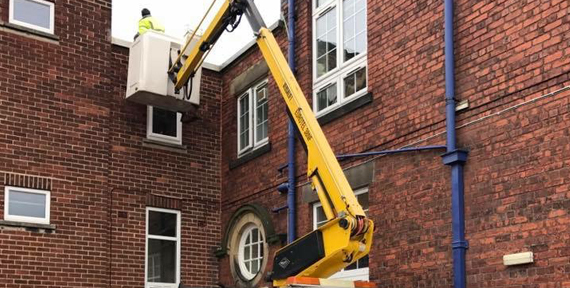 Planned Roof Maintenance Contracts are undertaken, cleaning, maintenance and repairs of Industrial, Commercial and retail Roofs through the country.